Wow, that's not what I expected from an Oddworld trailer. Abe's Oddysee certainly had its moments of drama, but—within that drama—it also had fart jokes. This, the new E3 trailer for the revamped version, has the tone and style of a game that contains no farting whatsoever. Where are our farts, devs? It's okay, I'm pretty sure they'll be farts. That's thanks to the previous (and more informative) GDC trailer, which showed the game in action. Yup, still looks like old-school Abe to me. 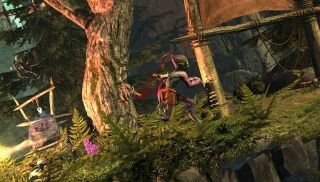 Oddworld: New 'n' Tasty is due out "Soon".